This assertion is based on new U.S. Bureau of Labor Statistics data that shows that when you combine paid (your job) and unpaid (child care and housework) work, married moms work only about 20 minutes more per day than married dads do, the smallest difference ever reported (in childless couples, men actually work - paid and unpaid - 8 minutes more per day than women!). While it has become popular for women to air their grievances about their lazy husbands and for the culture to permit them to do so, I think this data is not surprising to most people (is it?). In other words, just because dads first shift is longer than moms does not mean she is working more. She is working differently and, as most people also understand, she is often doing so by choice. As the writer of the story -- a working mom -- points out, she is exhausted by all the work she has to do because she decides to go home earlier than her husband does, and thus is the one who faces the children and messy house first. But despite this, married dads are putting in 53 minutes per day of child care  three times more than they did in 1965  while moms put in 70 minutes per day (about the same as they did in 1965). But enough with the data. What is really going on here? Why do moms still feel overwhelmed? A few of us at NFI have long asserted that the reason moms feel overwhelmed is that they have a powerful desire to be the lead organizer/scheduler/chauffeur/referee/cook/etc in the home, regardless of how much they work, and they often do so at the expense of dads involvement. Sharon Meers, in her book Getting to 50/50, writes extensively about this. So, while dads have had to make room in the workplace for moms, moms have not been expected to (nor have they often been willing to) make room for dad in the home to the same extent. 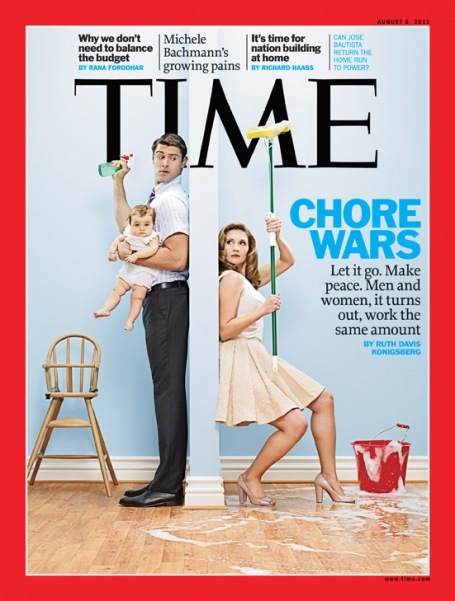 Clearly, out of necessity, working moms have had to allow dads to get more involved, but the fact that women still feel overwhelmed is a testament to the idea that they sometimes cant let go of their traditional dominion over all things domestic. So, really, the debate is no longer about time, but about turf -- and moms want to retain their home turf advantage. So, while it is helpful to have data that shows that dads are not slackers, we still have a problem to solve: how can we help moms feel more comfortable ceding some of their home turf to dads?